WAIST HIGH: Happy 25th Birthday The Golden Age Of Wireless. Happy 25th Birthday The Golden Age Of Wireless. 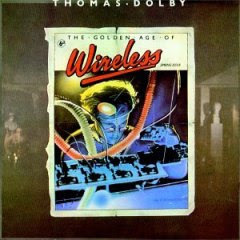 "Though all of (Thomas) Dolby's studio albums are excellent, his debut album, The Golden Age of Wireless is still his crowning achievement." Following the album's overall theme of radio are the songs "Airwaves," "Commercial Breakup," and "Radio Silence," along with songs about the modern world "Windpower," "Flying North," and Waist High favorite "Europa and the Pirate Twins." At the time of the original US release, the moody and cinematic tone, a major departure for synthesizer-driven records, prompted Musician magazine's reviewer to declare it "The best damned synth-pop record ever, period."